Excellent swimmers, Saltwater Crocodiles can be found in the northern parts of Australia along the coastline and up to 100 kms inland. When there are floods such as during the rainy season, they will use that to their advantage venturing far inland to enjoy prey. However, not a win-win situation. For the hunted. 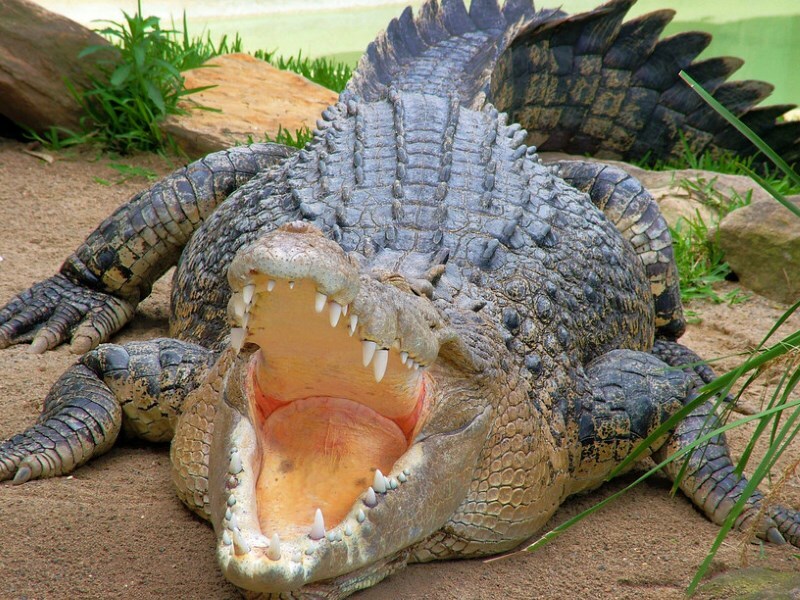 Also known as ’Saltie’ or Estuarine Crocodiles, beautiful in their own right, they are dangerous animals. In fact the most dangerous of any animal in Australia. They are also quite intelligent when hunting prey, using tactics that completely surprise the unwary with their explosive power and determination. As their noses and eyes are on top of their heads, it makes it easy for them to hide and move about in murky waters as very little can be seen of them. Known to even hunt sharks, they will wait patiently, up to days at a time, for their quarry while hidden under the waters. Anything that ventures near, including prey as big as water buffalo are targets. Birds, fish, unwary fisherman campers. While young, their mother will watch over them, helping them to get to water. They will also protect them before they disperse into the wild a few weeks later. Most people would be well advised not to try and cuddle one. There are tours that take you into the wilderness of Northern Australia where you can see their habitats, however, due to their ability to hide so well, it is rare to spot them. Only go with extremely experienced guides. Although their numbers are reasonable, they do face the threat of illegal hunting in the wild for their hides and shrinking places to live. They also have a terrifying reputation, which does not help.